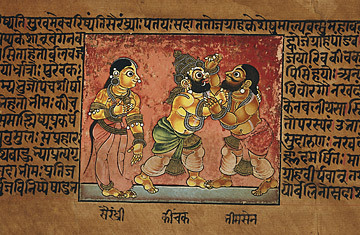 Artwork depicting an episode from the Indian epic, the Mahabharata. It's the world's longest poem  over 1.8 million words, containing over one hundred thousand verses and approximately ten times the length of the Iliad and Odyssey combined. And now India's celebrated epic the Mahabharata, the writing of which began around 300 B. C. by the venerated Hindu figure Vyasa, is being written again  one 140-character tweet at a time. Chindu Sreedharan, 36, lecturer in Journalism and Communication at the Media School in Bournemouth University, England, says he has always had a soft spot for the epic tale, the narrative of a war between cousins Pandavas and Kauravas. "It's more cultural than religious," he says. "Most [Indians] know the storyline. It's something our grandmothers have told us." That and his keen interest in social media led Sreedharan to start experimenting with the epic, writing it in short bursts online to see how it would read in that format. After three weeks of posting entries, his "Epicretold" twitter feed had gathered more than 1,000 followers. Sreedharan is not the only writer of what he calls "Twiction." Philippa Gregory, author of the best-selling novel The White Queen, is using Twitter to reinterpret her book as a series of tweets from its main character. Penguin has commissioned two 19-year-old University of Chicago students to put together a book titled, Twitterature: The World's Greatest Books in Twenty Tweets or Less, to be published later this year with synopses from Shakespeare's works, to the Harry Potter series, to of course, Twilight. The format has its creative advantages. Instead of telling the classic story through the eyes of a the main narrator as in the original Mahabharata, Sreedharan takes the point of view of an heretofore one- dimensional character, Bhima, one of the five Pandava brothers who defeat their cousins, the Kauravas, in tale's central battle. "Bhima has been the brawny superman of Mahabharata," says the Indian-born academic and journalist. "Here he is being presented as someone who is really sensitive and intelligent." The irony of condensing a million-word epic into a series of tweets  of which Sreedharan has so far posted 92  is not lost on him. Nor is the challenge. "You want to write tight, but you don't want to write so tight that the meaning gets lost for people who're not familiar with the story," he says. "What I'm trying to do is to make sure there is enough drama in every twepisode, so to speak. There's a cliffhanger, wherever possible." The old epic could use a little dusting off. The younger generation of Indians, not to mention non-Indians who haven't grown up listening to the epics stories, find the long, complicated tale too difficult to follow. Even in modern retellings  of which there are many  the Hindu philosophy, the wide cast of characters, and the scope of the tale make the Mahabharata a challenging read. Sreedharan says he wants to simplify the story and make it accessible to both young Indians and foreigners alike. "Without giving it the canopy of an epic, if it's projected as just a tale  and a beautiful tale  it'll be interesting for anyone."